Yesterday, as I write, I flew back to Belgium after a few weeks at home in Gothenburg. 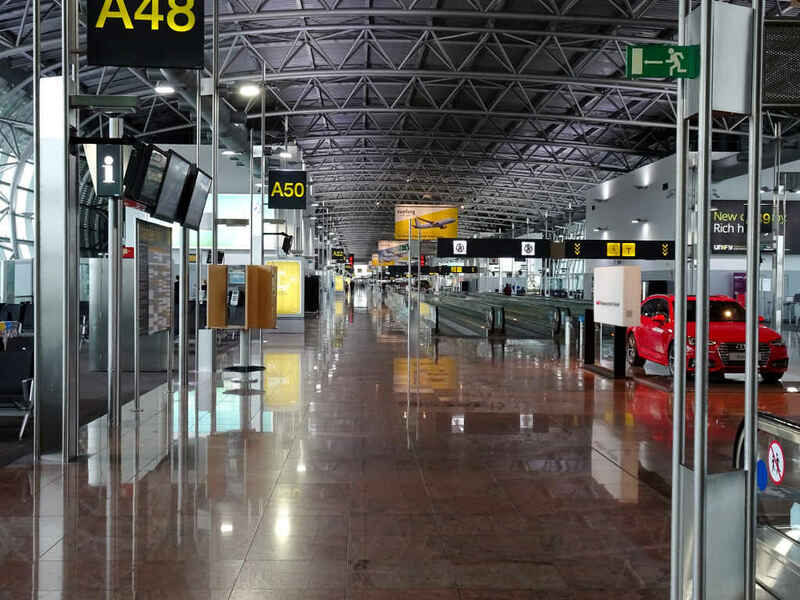 It was exactly two weeks to the day after the bomb attack on Brussels airport, and up until Monday I had not expected to pass through Brussels International. I was fully prepared for a flight to Antwerp or Liége followed by a bus journey, but no. 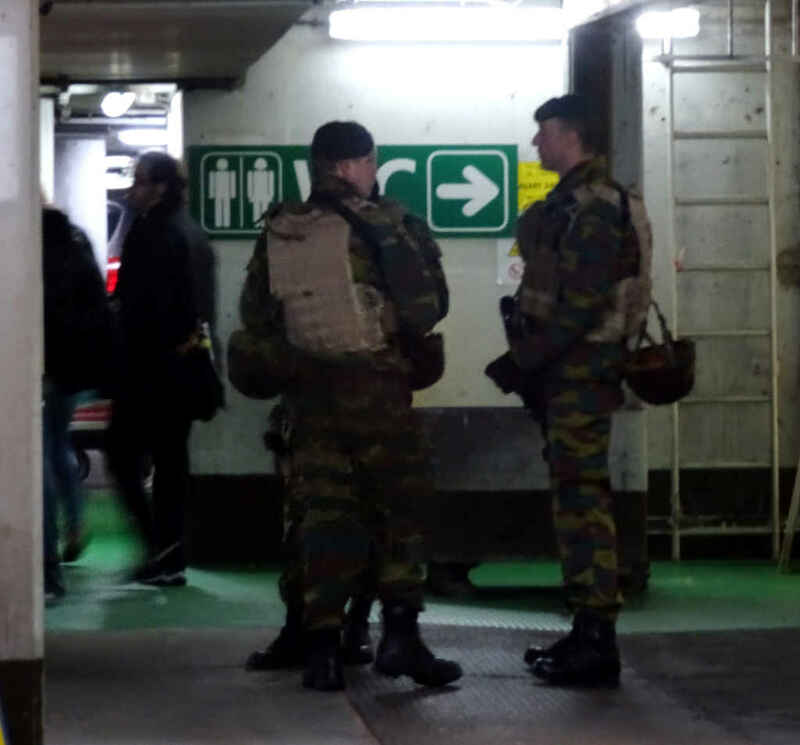 Brussels airport is struggling back onto its feet, shaking off the effects of the attack, and the first planes in and out flew on Sunday. Not to say that Tuesday was business as usual by any means. There were just a few flights and the place was emptier and quieter than I have ever seen it. Still, though, it was working. Here are a couple of photos taken of the gates. The moving walkways were running, but just a few people were travelling on them. 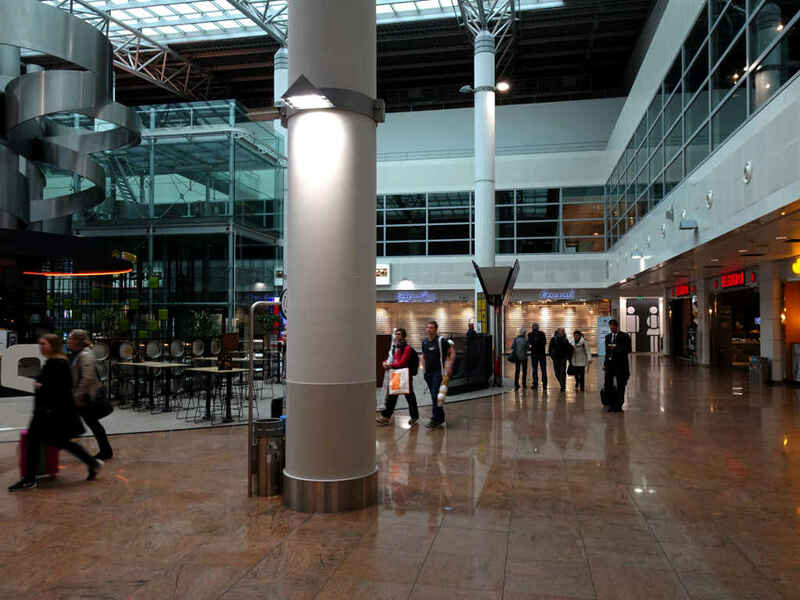 Many of the airport shops were shut (above), though the restaurants around the atrium (below) were open. However, most travellers seemed keen to pass through and move on. 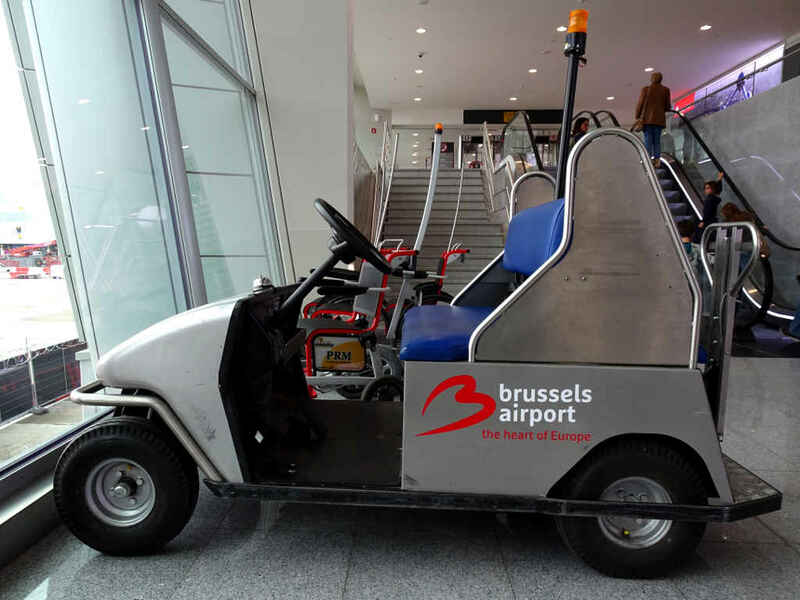 This electric cart (above) carried a reminder of why Brussels International needs to re-open as soon as it can. But the baggage reclaims hall (below) was desolate. I didn’t think the security was very obvious, but it was certainly there (above). 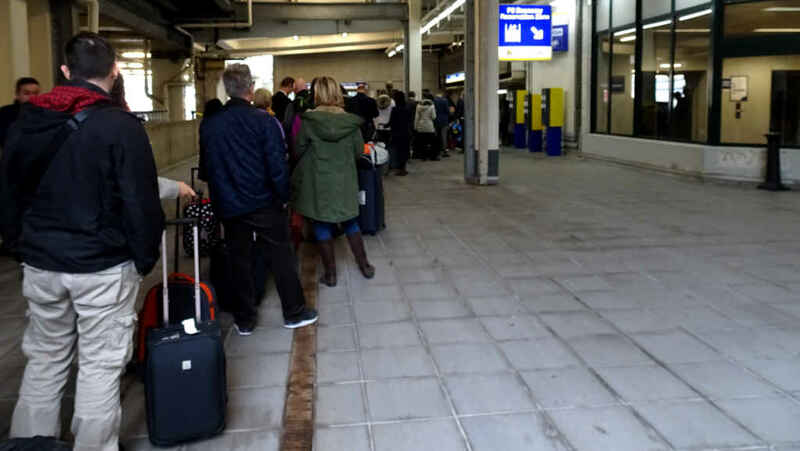 The direct trains and buses that usually shuttle passengers to and from the airport were suspended. It was taxis only (or private cars). The taxi queue was long, but orderly and efficient (below). 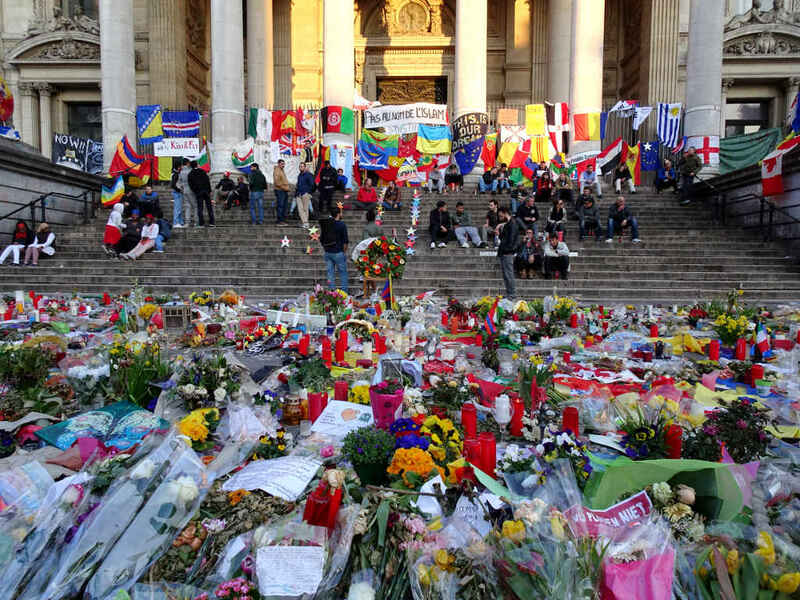 Later in the afternoon Mrs SC took me by the Bourse to see the flowers and signs and all the people who still stand around here, meditating, mourning, praying, adding their own messages and/or taking photos (above), “Pas au nom de l’Islam” – Not in the name of Islam. 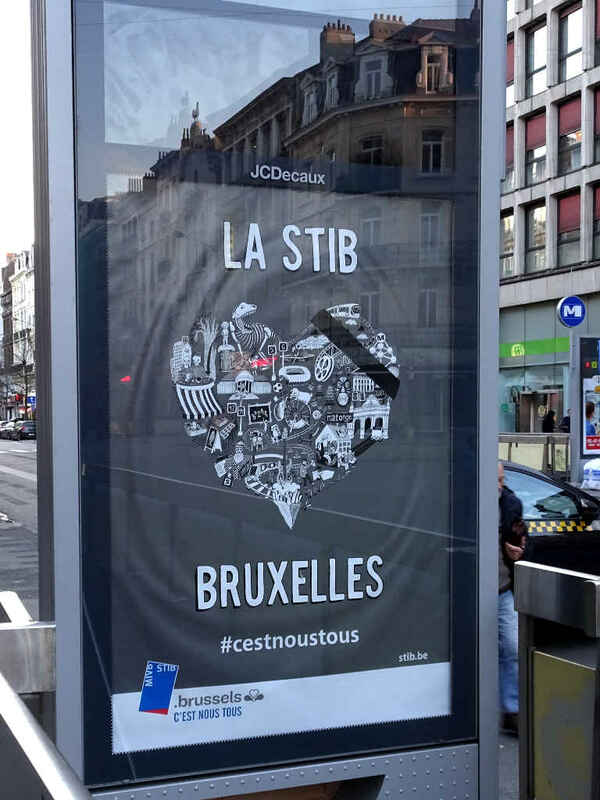 Even Brussels public transport (STIB) is wearing mourning after the bomb attack on the Maelbeek station. A current campaign to get people to use public transport has been adapted to the circumstances with a monochrome colour scheme, a mourning band and a re-purposed hashtag. 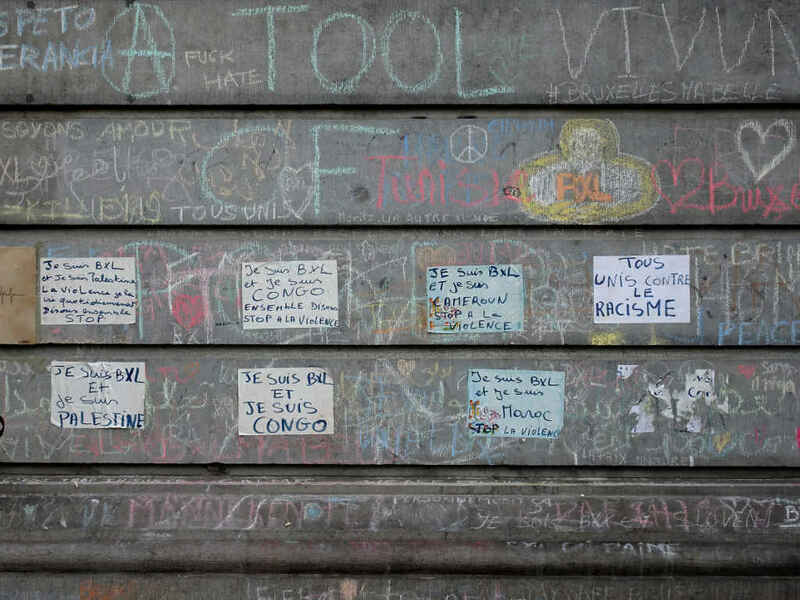 Bruxelles c’est nous tous – Brussels is all of us. I originally published this article on the separate Stops and Stories website. Transferred here with a little polishing for SEO and a new featured image 18 May 2017.